We specialize in bringing you 100% Irish handmade jewelry crafted in exceptional quality metals of sterling silver, all gold types and platinum and all our jewelry is made at our workshop here in Enniscrone, Co.Sligo at Ardri Jewellery. Each piece is handmade to order just for you. When we receive your order we put it into production with our design team and our goldsmiths and put your individual order in their skilled hands. These highly trained and exceptional gold and silversmiths use a mixture of traditional and unique handmade tools to design, cut, melt, solder, hammer, set, buff and polish each piece by hand. Combining traditional techniques like chasing, repousse and hand piercing with a vast knowledge of Irish culture and history your piece is created with great care and attention to detail. Before being quality tested, it is then ready to be packaged and shipped. Each Ardri Jewelry piece is accompanied by a “Certificate of Authenticity” - our assurance to you of its quality and birthright. Jewelry of this quality takes longer than mass produced jewelry but we know that once you hold that rare piece in your hand you will understand the allure of an original piece of jewelry. Our reputation and your satisfaction is very important to us which is why we offer a one year warranty on every piece of jewelry our designers make. This warranty covers every item of fine jewelry we produce for any defect in manufacturing and covers the repair or replacement of your jewelry at no cost to you, our customer. It does not cover damage due to wear and tear, the loss of precious stones or theft. Your warranty will become void if the piece has been worked on or repaired by another jeweler. Should you have a problem please contact us by e-mailing to info@ardrijewellery.com and we will immediately arrange to have your jewelry returned to us for inspection. We sell only genuine Irish handcrafted jewelry, designed, created, manufactured and assayed in Ireland. We can therefore send you our unique “Certificate of Authenticity” with every piece of jewelry purchased. This is a personal guarantee from us to you that your jewelry piece has been created from start to finish here in Ireland. 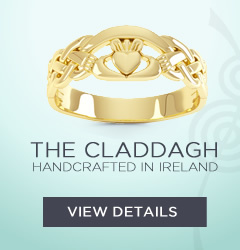 It is 100% Irish made.